The United States Department of the Interior was officially created in 1849. Among its responsibilities are overseeing federal land and natural resources and dealing with issues pertaining to Native Americans, Alaska Natives and Native Hawaiians. Conversely, what are known as 'interior ministries' in other countries tend to deal with matters that are usually under the jurisdiction of the Department of Homeland Security or the Department of Justice in the United States. The department is headquartered at the Main Interior Building in Washington, D.C., opened in the 1930s. Its previous headquarters had been viewed as a model for government offices for several decades. Both of the buildings were added to the National Register of Historic Places in 1986. 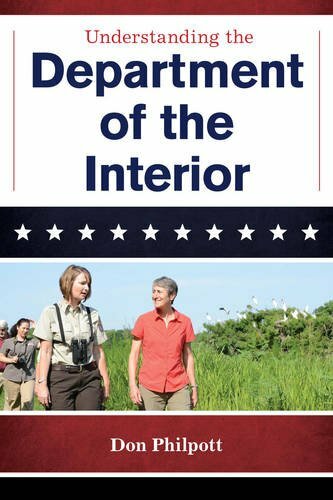 Arguably the most well-known agencies of the Interior Department are the National Park Service and the United States Fish and Wildlife Service. Created in 1916, the NPS manages national parks and numerous monuments. In addition to other duties, it also administers the National Register of Historic Places. The U.S. Fish and Wildlife Service was formed in 1940 and manages fish and other wildlife, along with their natural habitats. It is the primary agency in charge of administering the Endangered Species Act. Other agencies include, the Bureau of Indian Affairs, which deals with issues involving Native Americans and Alaska Natives; the Bureau of Land Management, which administers public lands; the Office of Surface Mining, an agency involved with overseeing mining and the lands that they directly effect; the United States Geological Survey, the Interior Department's only scientific agency and the Office of Insular Affairs, created to deal issues pertaining to American territories. Traditionally, the United States Secretary of the Interior is 8th in line to the Presidency. It is the 5th-highest ranking position in the United States Cabinet. A former United States Secretary of the Treasury, Thomas Ewing of Ohio, was the first Interior Secretary. In more modern times, the position has predominantly been held by individuals from states generally considered to be part of the Western United States. Among the more well-know Interior Secretaries have been James Rudolph Garfield (son of U.S. President James Garfield), Jacob Thompson, (who later became a major figure of the Confederate States of America) and Lucius Quintus Cincinnatus Lamar II (later a Justice of the U.S. Supreme Court). The longest-serving Secretary of the Interior has been Harold L. Ickes of Illinois. Ickes was the Interior Secretary for the entirety for Franklin D. Roosevelt's presidency and for the first several months of the Truman administration. Conversely, the shortest-serving Secretary has been Thomas McKean Thompson McKennan. Previously a member of the United States House of Representatives as part of Pennsylvania's delegation, McKennan was Secretary of the Interior for less than two weeks during the administration of Millard Fillmore. Other brief holders of the office include Ewing, who served for roughly four months (including during the tragic transition from President Zachary Taylor to President Fillmore), and Stanley K. Hathaway, a former Governor of Wyoming who was Secretary for less than four full months under President Ford before resigning because of poor health.